Time to head back into the padded room!!! The Asylum Volume 2 has landed on my doorstep so I have no choice but to step right in and go for a ride. Let the madness begin! 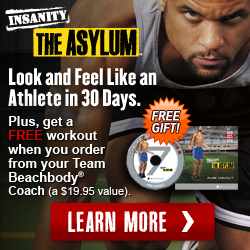 Shaun T was completely out of his mind with Insanity, gone to outer space with The Asylum Volume 1, and now certifiably cuckoo with The Asylum Volume 2. I have been anxiously waiting for this for quite some time so I’m SUPER excited to be sharing each workout with you again, just like we did with Volume 1. I started today with just the Agility Tutorial. It has been months since I did Asylum Volume 1, and while my feet have certainly been busy dancing along the mountain trails, it has usually involved primarily FORWARD motion, not so much laterally or backwards. This tutorial is FANTASTIC and 100% recommended for everyone starting the program, even if you are a seasoned veteran of Volume 1. The moves are much more complex with longer patterns to learn – no more simple hopscotch or hopping from one end to the other, it is like he has gone 3-D! This is what he is calling his Athletic Matrix - his breakthrough pro-athlete training model that uses dynamic multi-directional movements to activate multiple muscle groups at the same time. Shaun T takes the time to break the moves down into smaller units that even I can start to manage. I have a feeling these moves will come up in the coming workouts, so getting a handle on them before starting is super smart! 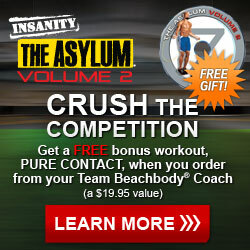 What types of workouts are in The Asylum Volume 2? What comes with The Asylum Volume 2? Great question! At the time I’m writing this, the only kit available is the Base Kit which comes with the workout discs, schedules (30 days plus an additional 8 week Asylum 1/Asylum 2 hybrid schedule), quick start guide, and nutrition guide. You will need to have your own agility ladder, speedrope, weights, and floor mat. If you already own The Asylum Volume 1, you should have everything you need. If you don’t, I suggest getting it and starting with that program before taking on The Asylum Volume 2! Watch me do my best with today’s workout!